Fundraising has been one of the most fulfilling aspects of any job I’ve ever had. It’s not hard to be motivated to come to work every day knowing that what I’m doing is making a different in literally millions of people’s lives. I am motivated knowing that Nadine, a 9 year old, received deworming medication and was able to attend school. She’s now a vibrant 13 year old because of the work we did. YOU can receive this same level of fulfillment from fundraising. 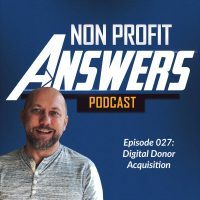 No matter where you’re at in your journey to nonprofit development, I want to encourage you to study, learn, experiment, fail, and BECOME a fundraiser. My goal in major donor ministry is to grow friends, to minister truly and deeply to individuals, whether they ever give again or not. We become stakeholders in each other’s lives. But because of my passion for my organization’s mission, and because of the deepening relationship between that donor and me, it’s almost inevitable that the donor will grow more committed to the ministry I’m involved with. His giving, then, will be a by-product of that commitment. If you don’t like people, fundraising may not be for you. You must care more about the donor as a human being than you do about his gift. Even when you’re doing mass fundraising (like direct mail or email marketing), you must care deeply about what your donor base is thinking, feeling, and doing. If you care about people, they will care about what you care about. I’m going to let you in on a little secret: sometimes, we fail as fundraisers. Sometimes an email campaign you think will raise tens of thousands of dollars instead raises $500. Or a telemarketing campaign falls flat and you up end up well short of your goals. One key to continuing on: learn to be tenacious and don’t let failures get you down. You’ll suffer from fundraising flops. One of my staff members calls it a “whiff” when we have a campaign that gets a 1:1 return when a 3:1 was expected. When you have a whiff, don’t dwell on it, but instead, look into why it didn’t work. Learn from these mistakes so your next campaign can come out even stronger. You may enter a season of difficult fundraising times. In 2012, we had a tough time with the economy and uncertainty. Fundraising didn’t perform to the level we hoped, but we fought back through it. We changed what we needed to change. Cut costs where it made sense, and came through even stronger. Being a successful fundraiser requires you to be able to get up, shake it off, and move on to the next campaign with a stronger ask, a stronger appeal, and a stronger understanding of how your audience thinks. If you don’t care about your cause, I recommend you move on to a nonprofit organization that better matches your interests. Your job becomes infinitely more enjoyable when you’re working for a nonprofit where the cause aligns with your values. Fundraising isn’t always easy. In nonprofits, its often stress filled as you know the organization or programs within the organization rely on you to achieve your goals! When you are fulfilled by the mission of your organization, you will work through the stressful times to find the successful times. YOU have the capability, strength, and skills needed for a career in fundraising. Once you align what you care about with the right organization and focus on serving both your beneficiaries and your donors, you will find success.